Get to Know Us & Ticket Giveaway! Hi, I'm Kristin. My husband, Mark, and I run X8 because we're passionate about percussion. In my personal life, I fell in love with the joyful sounds and high-vibration of African Marimba and Zimbabwean hosho shakers. For the past 2 years I've been studying and performing with the Rattletree School of Marimba ( www.learnmarimba.com) in Austin, TX.This weekend is the culmination of so much hard work by me and my bandmates. I'd love to bring the Texas X8 community together to experience this incredible show presented by the City of Austin Cultural Arts Division. Rattletree's - The Earth Loves You debuts this Friday, Sept. 18th. 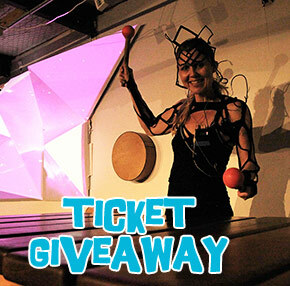 It's a fun, high-energy, all-ages show fusing traditional African music played on GIANT xylophones, electronic dance music, crazy costumes, and a backdrop of whimsical sculpture and psychedelic video projection mapping. The Earth Loves You runs **Sept. 18th - 20th** at the **Rattletree School of Marimba** (2311 Thornton Rd. Unit K, Austin 78704). We're giving away 2 pairs of tickets to the shows this Friday, September 18th. TO ENTER: Post "I want tickets to @Joel Laviolette and Rattletree https://www.facebook.com/events/817245338382487/." on https://www.facebook.com/x8drums. One entry per person. Contest closes Sept. 17th at 7 PM CST. Winners will be emailed. Good luck! Two showtimes available: 7 PM and 9:30 PM. Which Drum should I Choose - Traditional or Synthetic?